Finally at around noon I accepted the reality that this was something bigger then my lack of sleep the night before. I texted two friends to see if either of them could get Averi from school. They both said yes! One had an activity for her daughter after school and offered to get Averi into it as well. The other offered to take Averi back to her house and keep her for a few hours so I could keep resting. Well, yes and thank you! Another friend saw my post on Facebook and texted me to see if I was okay and offered to help if I needed it. She also told me she had an upset stomach too, and was very gassy. The next day all of them texted to see how I was doing, and if I needed any more help with Averi. So even though everyone checked in yesterday and offered help, I was feeling good enough to do everything myself. But I really wanted ginger ale to sip on during the day. I went to the grocery store (where while I didn’t know anyone, Averi saw a guy in a chefs coat and is now convinced it is someone from a cooking show) and bought a two liter bottle of it. And after one glass I realized I really didn’t like the taste of diet ginger ale. So today, feeling 100% better – because I know you wanted to make sure 🙂 – I went to Pinterest to see what else I could do with the ginger ale. I found an intriguing recipe for glazed carrots and one for bundt cake, but I didn’t want to actually cook. But I was game for drinking! 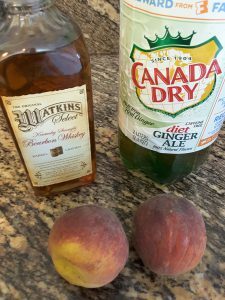 I found a really good looking recipe for a bourbon peach slush on Recipe Runner. And I happened to have two peaches that were about to go bad. 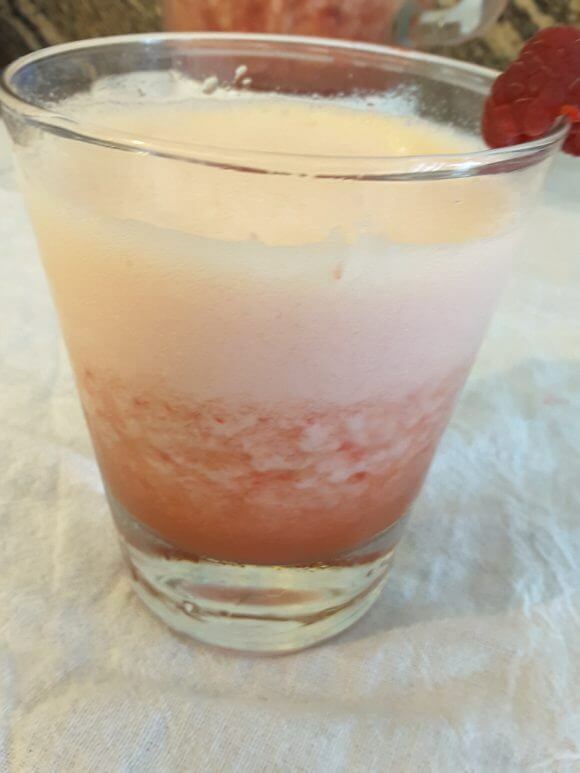 The original recipe called for frozen peaches, but I just added ice cubes to make up for it. And then as I started to cut up the peaches I realized one of them actually already was bad. So I dumped in a carton of raspberries to make up for it.